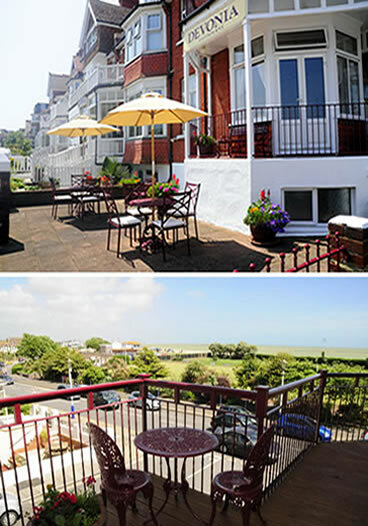 Devonia is a charming Victorian property situated in a superb location on Eastbourne’s elegant seafront. Our guest accommodation for bed and breakfast is comfortable and welcoming. There is a free private car park for guests and Free Wi-Fi Internet connection in public areas. Take a leisurely stroll along the promenade to the Pier, past the colourful Carpet Gardens to the Bandstand - towards Holywell and the foot of Beachy Head. In the opposite direction you will find Princes Park, the Sovereign Harbour and attractions for younger visitors - whilst the Town Centre with its wide range of shops, bars and restaurants, is just a few minutes walk away. The resident proprietors, Terry and Carolyn Jane have many years experience in the hospitality industry and will ensure you have a relaxing, enjoyable and comfortable stay at Devonia.